It’s a rare feat that an artwork becomes immediately iconic. Both “The Nightmare” by the Swiss-born artist Henry Fuseli and “Table” by Allen Jones caused a sensation from their first public appearance – the former in 1782 at the annual Royal Academy exhibition in London, the latter nearly 190 years later at Tooth & Sons gallery in 1970, also in London. Perhaps the definition of iconicness (don’t interrupt my argument by looking it up – it’s not a word) is how far it filters into popular culture. The Nightmare was referenced many times in cartoons in its day. In our age Table and Chair have been quoted and parodied in art, advertising and film (A Clockwork Orange). There have also been a fair few cartoons about it over the years, the most well-known of which is probably this. The original cartoon was displayed in Allen Jones’ recent retrospective at the Royal Academy. Every now and again, in my non-cartooning art life, I cross paths with Allen Jones. It happened again shortly after my cartoon was published. Realising that this was probably the only opportunity I would ever get to see the reaction of an artist looking at himself in one of my cartoons, I dragged it up on the internet and showed it to him. He enquired about buying the original. We agreed on a price and shook hands. I was doubly glad. One – I was skint. Two – this was the last cartoon I had drawn for the Guardian (a casualty of yet another round of budget cuts – times are tough for newspapers in the internet age) and I had, therefore, the faintest paranoia that perhaps Allen had complained to the Guardian (I was fairly sure Fuseli lacked wifi connection, so I ruled him out). I mentioned this to him. He replied that “if I was offended by that I would have been dead a long time ago.” Indeed. It’s hard to think of any living artist who has endured more opprobrium than Allen Jones. His first sculpture, “Hatstand“, wasn’t conceived as a hatstand, just a figure with its hands out saying “Here I am”. He quickly realised that it could possibly be mistaken for a window mannequin so to prevent this reading he gave the sculpture a function – a hatstand. He gave the next two sculptures even more obvious functions – a table, a chair. “Of course I realised it would be seriously irreverent. But I was only interested in what impact it would have on art language.” He was attempting to ruffle the sensibilities of the art world. But as the figures in his furniture sculptures are so realistic the distinction between art and life is not so clear. Although he didn’t see it coming, his work ruffles the sensibilities of the real world just as strongly. 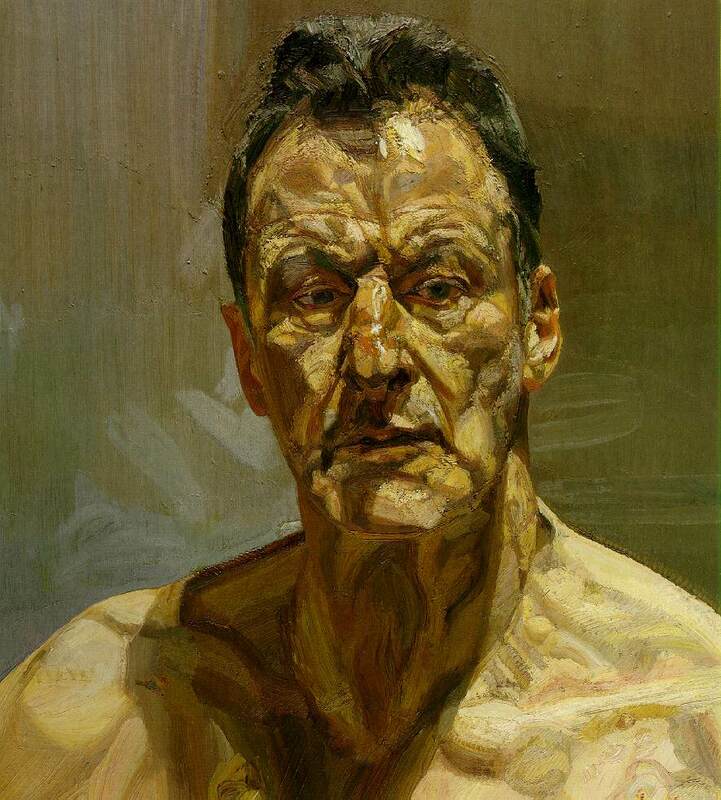 For another example of an artist not seeing the (to others) obvious effect of their work, I remember reading with disbelief an interview with Frank Auerbach where said he was shocked and surprised by the emphasis of the critics on the thickness of his paint. Considering that these were some of the thickest paintings ever painted this seems disingenuous. But he claims he just kept painting over and over until he got the result he wanted and didn’t even notice how thick the paint was getting. Still, the reaction of not seeing the patently obvious seemed unbelievable – until it happened to me. For a time I was intrigued that painters could paint completely realistically but could have radically different styles. I wondered what a single figure would look like if it was painted in 2 highly realistic but different styles. I copied the body of Caravaggio’s Bacchus, which is basically one colour with smooth transitions from light to dark, but painted the head in a Lucian Freud manner, who achieved his high degree of realism by quite opposite means, mainly by lots of subtle colour changes. To find a head to match the Bacchus body, in the right position with the right lighting, it was easiest just to use a mirror. When I exhibited the finished painting noone said “that’s an extremely interesting combination of 2 different yet completely realistic painting styles within the one figure.” Oh no. There were accusations of self-love. The word Narcissus was bandied about. Now, of course, I realise it is the natural reaction to seeing my head plonked onto the homoerotically-charged body of a masterpiece of Western Art. What was strange was that I did not anticipate it at all. To be fair, I don’t think I accomplished my aims very well. My head wasn’t Freudian enough. I remember being very distracted when I painted it by my beauty. So I am inclined to believe what Jones says about his motivations. Once I finished the cartoon (my cartoons are drawn with an ink pen but most of the shading is done in photoshop – when I sell an original I paint the shades of grey with acrylic paint) I delivered the artwork to Allen’s home/studio. We had a great chat, along with his lovely wife Deirdre, after which he kindly showed me around his studio upstairs. Amid some of his iconic standing sculptures and several recent portraits of Kate Moss were some new paintings which made me do a double take. His painting technique is now so refined that the figures almost look spray painted. Although not obvious at first I soon realised that within each of these paintings of figures was a 3 dimensional moulded face. It would dawn on you that there was a face at, say, the juncture of dress and cleavage, but as it was overpainted by the figure you wouldn’t quite register it. He was also making sculptures with flat sheets of coloured perspex which he would bend into shapes to resemble a face. The intriguing thing was that the ends of the coloured perspex sheets would naturally glow like an LED light. The interaction between plane and glowing edge added an extra dimension to the Caro-esque shapings of the face. It was particularly intrigued by one of these sculptures in his RA retrospective, its cast shadow offering as many possibilities in shape and transparency/opacity as the sculpture itself. What was particularly great to see was his enthusiasm and excitement. It made me realise that, in my experience, serious artist and jaded are two mutually exclusive terms. I don’t actually think it’s possible. Making art keeps you mentally and physically interested in the world – even if it is uncomfortable.